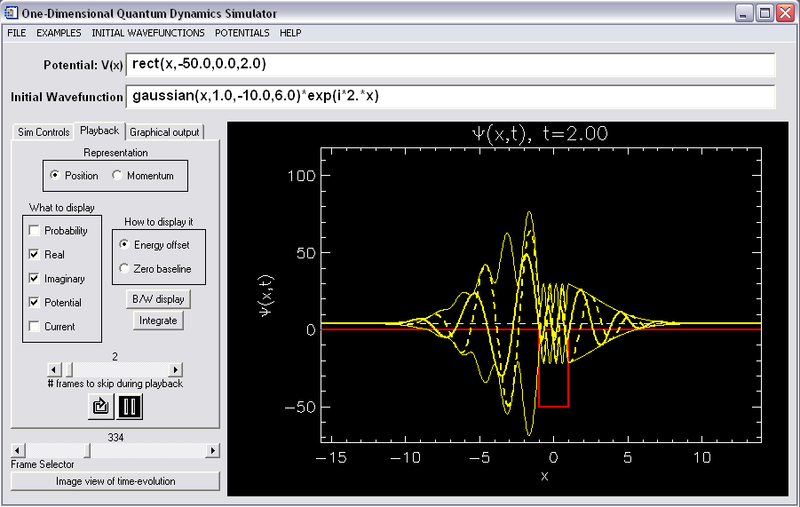 The IDL program SE_SIM.PRO is an application that provides visualization of the time-evolution of quantum mechanical wavefunctions in 1 dimension. It is essentially a GUI wrapper for a function, TDSE_SOLVER.PRO, that solves the Schrodinger equation for a user-specified initial wavefunction and potential. SE_SIM.PRO requires IDL 6.2 or higher to run. The numerical integration of the Schrodinger equation is based on an algorithm presented in an article by Goldberg et. al. in the American Journal of Physics in 1967. In this formulation, the Schrodinger equation is solved with h-bar = 1 and 2m = 1. In this scaling, the units for x and m can be selected freely but such selection determines the units of time and energy. For instance, in one scaling, energy can be expressed in eV, unit distance is 0.03 nm, and a unit of time is 0.66 fs (femto-seconds). The application SE_SIM.PRO has a number of useful features listed below. SE_SIM.ZIP (813 kB)--Contains all of the IDL files and documentation. Unzip this file into a directory in your IDL path. Type SE_SIM at the command line to get started. Documentation can be found as a HELP menu. SE_SIM.PRO requires IDL 6.2 or higher to run. Note that this application can be run with the IDL Virtual Machine by running the file named SE_SIM.SAV. Screenshot of SE_SIM user interface. Example frame output from SE_SIM of a wavepacket reflecting from a step barrier. 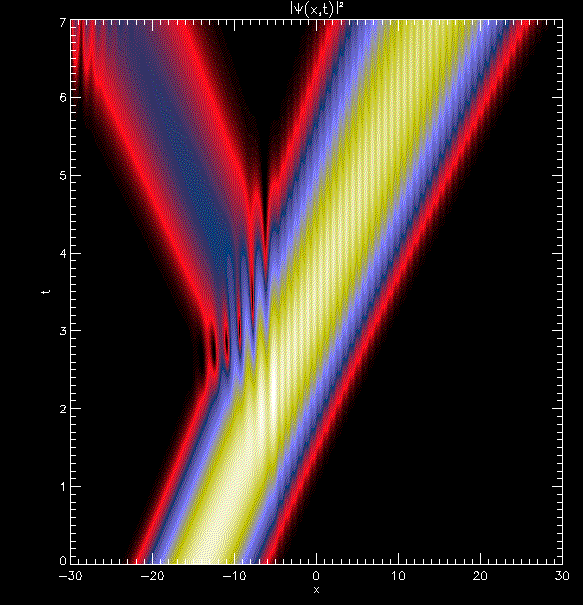 Example image output from SE_SIM of a wavepacket scattering (transmission + reflection) from a potential well. 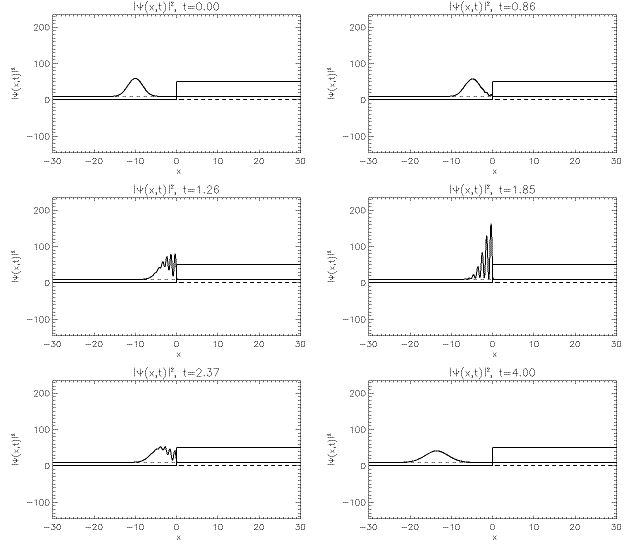 Here the probability density is displayed. 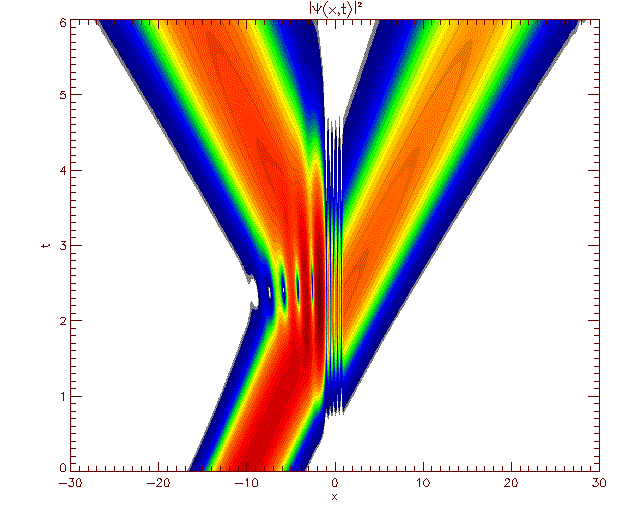 Example image output from SE_SIM of a wavepacket propagating into a periodic potential well. The probability density is displayed.